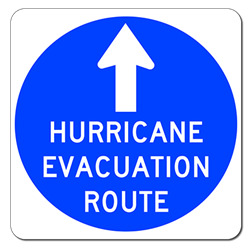 This easy-to-read HURRICANE EVACUATION ROUTE sign or label will give your employees and visitors specific information or instructions about Severe Weather issues. Sign can be used indoors or outdoors. Rated for 7-plus years of non-fading outdoor use. DOUBLE the working life of your Hurricane Evacuation Route Signs by adding 3M Protective Overlay Film (POF)! 3M’s high-tech POF protects sign faces against fading caused by the sun and harsh weather—and makes graffiti and sticker defacement damage easy to clear away without harsh abrasives. "Website very easy to use; I am a woman and not that familiar with shopping for this type of product. Description on website was perfect." Elaine R.